Music and more are set to delight at the lighting the Roosevelt Island's Holiday Tree. 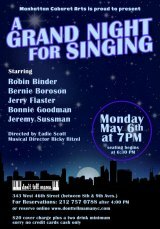 It's scheduled for 7:00, but festivities sparkle in song even earlier. "A multi-generational caroling group will be at the Tram at 5:30 p.m. and the Subway at 6:15 p.m. to greet Friday night commuters and to promote the tree lighting event," announced Main Street Theatre & Dance Alliance Executive Director Kristi Towey. "They will then open the event with two songs at 7:00 p.m."
The celebrations are expected to enjoy better weather than last year with little chance of rain and temperatures in the low to mid 40s. 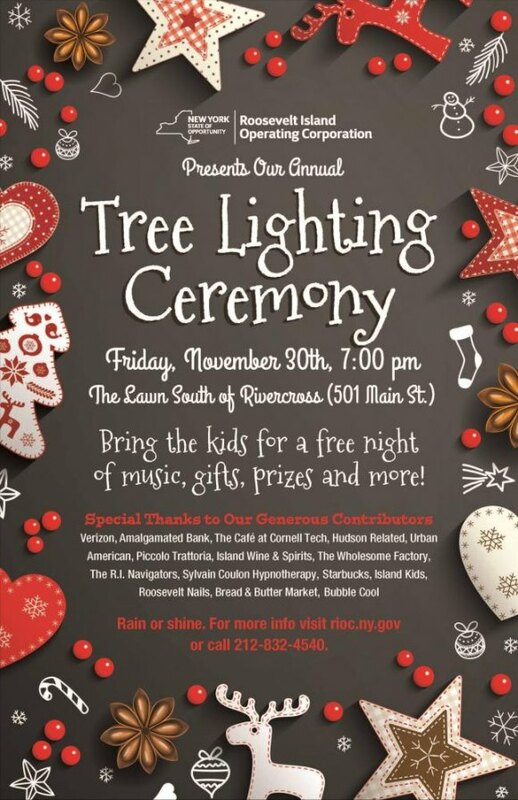 Organizer RIOC calls the Annual Tree Lighting "Roosevelt Island's most whimsical event." It happens Friday, November 30th at 7:00 p.m. on the Rivercross Lawn. RIOC invites you to enjoy "Live music by the Hotelheads band, Christmas caroling, free gifts, raffle prizes and more including a very special visit by Santa, escorted by NYPD’s finest motorcycle officers. Young and old get to take free pictures with Santa.